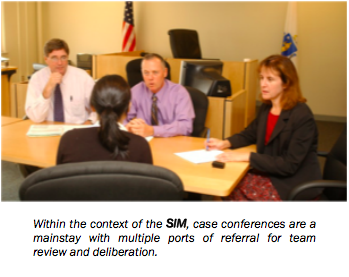 The Taunton Jail Diversion Program (JDP), an outgrowth of the CCIT, predates the nationally acclaimed Sequential Intercept Model (SIM). This community initiative consists of several components that allow for multiple points of entry, including incarceration release. The genesis of the JDP evolved from a desire to bring varied disciplines together to conference problematic cases that pose unique issues for police officers, mental health practitioners, probation officers, and concerned staff from a wide range of state and local agencies. ** Three day training focused on adult issues. ** Two day training focused on youth issues. ** "Train the Trainers" training including Instructor and Training Manuals. ** Instructors for any combination of the program components. ** Consultation and technical assistance in organizing community coalitions and trainings. The Sequential Intercept Model (SIM) provides a conceptual framework when considering the criminalizing of mental illness. It has a primary purpose of Jail Diversion but goes beyond traditional models in a consideration of a series of points of interception where appropriate interventions can be made to prevent an individual from entering or penetrating deeper into the criminal justice system. This presentation explores and explains the initial organization of a community crisis team and the requisite training that should be the foundation of intervention teams. We also address the crucial component of "staying power"... or how to keep the team cohesive.